how do we force them to resign? Tomorrow’s Sunday Nation opinion pieces are full of complaints against the ever growing culture of impunity among the ruling class in Kenya. We have become a nation in which cabinet ministers remain in office even when suspected of having ordered the killing of Kenyans a year ago, or turning a blind eye when public corporations were being looted by their cronies. 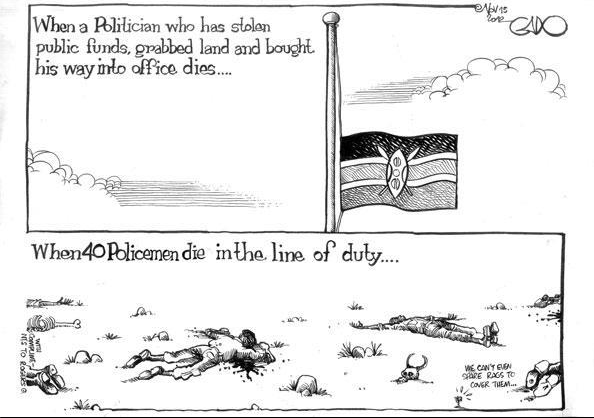 The police chief, the Attorney General and the justice minister still remain in office even after a UN-sanctioned report blamed them for allowing extra-judicial killings to take place in Kenya. The entire judiciary is one giant sty filled with corrupt judges and officials. Everybody knows this but no one wants to do anything. This may seem naive, but I am kind of surprised that Hussein Ali and Amos Wako are still in office. Especially Amos Wako. He is the man who is responsible for most of the rot in the judiciary. Under Moi he did nothing as the former president and his friends bastardized the judiciary. Kibaki probably kept him on on the request of Moi so as to protect himself and his friends against potential law suits. I say it is time Amos Wako went. He has been Attorney General for far too long with very little to show for it. During his tenure corruption has ballooned like no one’s business but with very few people ever being brought to court. And about our corrupt cabinet ministers…. Where is the supposedly vibrant Kenyan civil society? I think it is time they took Philip Ochieng’s advice and started agitating for the sacking of certain people implicated in the many scandals that have rocked the country in the last several months.